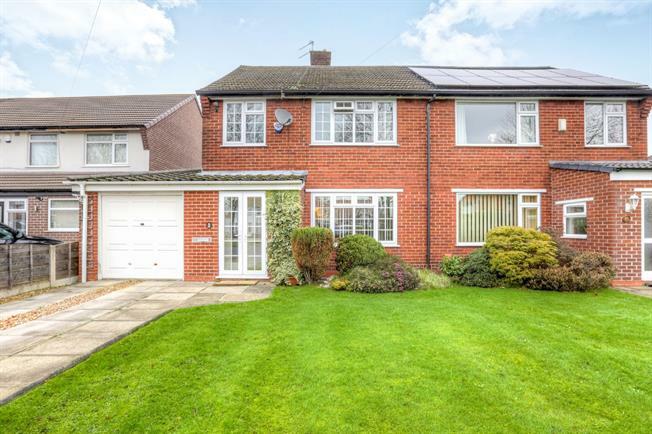 3 Bedroom Semi Detached House For Sale in Stockport for Offers in the region of £325,000. A superb three bedroom extended semi detached home. This impressive spacious home is in immaculate condition throughout and is credit to the current house proud owner. The home has been extended to the rear creating an impressive open plan kitchen dining area which overlooks a large lawned garden. The home has huge potential to extend over the attached garage creating a fourth bedroom with en suite facilities. This home benefits from having a larger than average garden with patio area a superb space to be able to entertain both family and friends. With off road parking for several vehicles this home really does tick many boxes and more. A spacious extended home with superb garden off road parking and potential to extend..